In the wake of the ‘Arab Spring’ several observers compared the changes in the Middle East and North Africa (MENA) to the transition of the former communist countries in Central, East and Southeast Europe (CESEE) to parliamentary democracy and market economy starting two decades ago. 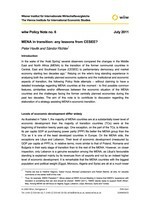 Relying on the wiiw’s long standing experience in analysing both the centrally planned economic systems and the institutional and economic aspects of transition, the following Policy Note attempts – without claiming to have a detailed knowledge regarding MENA countries at the moment - to find possible common features, similarities and/or differences between the economic situation of the MENA countries and the challenges facing the former centrally planned economies during the past two decades. The aim of this note is to contribute to discussion regarding the elaboration of a strategy assisting MENA’s economic transition.